On this week’s episode, Alex and Calvin chat with Carnegie Mellon Associate Professor of English Dr. John Oddo about his most recent work, The Discourse of Propaganda: Case Studies from the Persian Gulf War and the War on Terror. In the book, Dr. Oddo uses discourse analysis techniques to study U.S. war propaganda. Today’s discussion centers around what makes Oddo’s definition of propaganda unique. He argues that propaganda can best be understood as an intertextual process, and that everyone in U.S. society is a potential propagandist -- not just “evil dictators” in totalitarian societies. Dr. Oddo walks Alex and Calvin through one case study he conducts in his book: a historically-contextualized analysis of the U.S. military slogan “Support Our Troops.” In this analysis, Dr. Oddo discusses the genesis of the phrase as a reaction to anti-war sentiments in the U.S. during the war in Vietnam. He then dissects the linguistic aspects that make the phrase “detachable,” repeatable, and easily digestible, such as how personal pronouns like ‘our’ are used to forge common ground between the message and the audience. In doing so, Oddo suggests that propaganda slogans like “Support Our Troops” simultaneously make an argument justifying war, shape allowable identities for citizens, and become entrenched as “cultural presuppositions.” The conversation comes to a close with Dr. Oddo suggesting productive ways in which we can respond to propaganda critically, as well as the affordances and limitations of using propagandistic tactics for more just ends. Bakhtin, M. M. (2010). The dialogic imagination: Four essays (Vol. 1). Trans. Michael Holquist. University of Texas Press. Ellul, J. (1973). Propaganda: the formation of men's attitudes. New York: Vintage Books. Hodges, A. (2011). The "War on terror" narrative: Discourse and intertextuality in the construction and contestation of sociopolitical reality. New York, NY: Oxford University Press. Lembcke, J. (1998). The spitting image: Myth, memory, and the legacy of Vietnam. New York, NY: New York University Press. Linell, P. (1998). Discourse across boundaries: On recontextualizations and the blending of voices in professional discourse. Text-Interdisciplinary Journal for the Study of Discourse, 18(2), 143-158. Oddo, J. (2018). The discourse of propaganda: Case studies from the Persian Gulf War and the War on Terror. University Park, PA, PA: The Pennsylvania State University Press. Stahl, R. (2009). 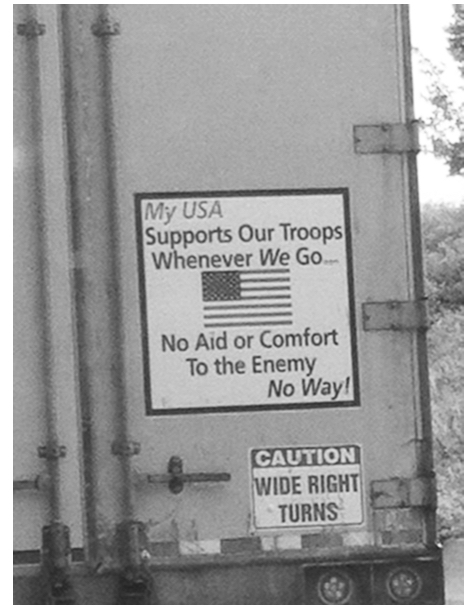 Why We “Support the Troops”: Rhetorical Evolutions. Rhetoric & Public Affairs, 12(4), 533-570. Central Transport truck with “Support Our Troops” decal, from Oddo (2018).